They are three of the most influential thinkers in South African sport. In each of their fields they are redefining the role of women in sport and are respected worldwide for highlighting the position of sport in our society, challenging the traditional views of sporting success and developing a new performance science. Stellenbosch is at the heart of the ground-breaking work being done by Ilhaam Groenewald, Elana Meyer and Dr Sherylle Calder. As one of the world’s legendary distance athletes, Elana Meyer was hailed for her unwavering commitment to excellence in her sport. And it’s this same passion that she brings to Endurocad, South Africa’s first academy dedicated to unearthing and fully developing the country’s distance-running potential. “We have so much talent in South Africa, but we are not seeing the performances we should. Traditionally we had a wealth of distance runners winning Olympic and big city marathons, but we’ve since been through a bit of a drought in that area. We should be up there competing for medals,” says Elana. The women around her also fuelled her desire to achieve excellence in athletics. “There was a long road of isolation, which meant missing out on the 1984 and 1988 Olympics. But in South Africa, women’s athletics was very strong with myself, Zola Budd and Colleen de Reuck, so I grew up in a generation of strong and competitive female athletes. Elana is also a firm believer that waiting for the perfect moment to do anything often means you’ll end up doing nothing, whether it’s chasing funding for Endurocad’s goals or making that first break that defined her iconic 10 000m race with Derartu Tulu in the 1992 Olympics. In the fast-moving world of Ilhaam Groenewald, it doesn’t matter that you are a woman in a male-dominated environment. What does matter is that you are adding value; the kind of value that she herself has shown in becoming the first woman to be voted onto the executive council of the South African Rugby Union and the second female president of University Sport South Africa. The kind of value that brings increased participation and transformation to all sports at the University of Stellenbosch. “As women, we need to focus on the value we add and the different skills we bring. We need to set our own standards,” says Ilhaam, a straight-talking, fast-thinking person who believes very strongly in getting the job done and doing it right. She is also not one to pay too much attention to the accolades of being a pioneer for women in the sports environment. In fact, she readily admits that she doesn’t know what all the fuss is about. “I believe there are many women out there who can do even more than I am doing today. We must find them and nurture them and see what difference they can make,” she says. This is why she is driving the new Academy for Girls’ Leadership and Sport Development at the University of Stellenbosch. It’s what forms the core of her belief that women should define their own role in sport and not have it defined for them. 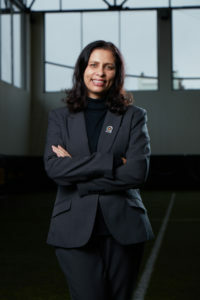 She believes implicitly in the value of university sport and its role in defining effective transformation at the national level. “When I was involved with SASCOC, I helped to draw up the first draft of the Transformation Charter. I believe it’s a good document, but each one of us must take it and make sense of it in our own environment. “I started at Maties in 2014 and then we had only 11% black, coloured and Indian athletes. Last year we had 22% and this year we’re up to 32%. So it’s not impossible. Our recreation and active lifestyle unit increased our participation figures by 61% between 2014 and 2016 because we revisited the programmes and came up with new ideas. is often referred to as the most successful person in world sport, and it’s easy to understand why. 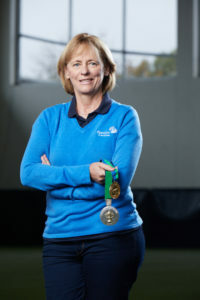 Since pioneering her ground-breaking visual awareness performance training in the 1990s, she has worked with the world’s best sportsmen, sportswomen and teams. She’s won two Rugby World Cups, with England and South Africa, and has provided visual awareness training for the All Blacks, elite British Olympic athletes, America’s Cup yacht teams, Tottenham Hotspurs Football Academy, the Miami Dolphins in the NFL, F1 driver Valtteri Bottas and too many more to mention. Sherylle’s current work includes assisting Eddie Jones in England’s preparations for the next Rugby World Cup, coaching at Bournemouth Football Club and improving the career of Miami Dolphins wide receiver Kenny Stills, who after working with her had his best season ever and sent her a signed jersey with the words, “Thanks for adding the edge to my game”. “If I can add an edge to one of the NFL’s greatest players at the moment, then I’m satisfied,” says Sherylle, who cares less for the praise than for the fact that her visual awareness science is a success. Whatever she does, whether it’s learning from rugby legend Danie Craven, one of her mentors, or counting the steps she takes to determine the most efficient route to her favourite coffee shop in Stellenbosch, or helping Ernie Els to win the Open in 2012, Sherylle is always looking to be just that 1% better.